Aerial tramway in Engadin, Switzerland, suspended on two track cables with an additional haulage rope. An aerial tramway, sky tram, cable car, ropeway or aerial tram is a type of aerial lift which uses one or two stationary ropes for support while a third moving rope provides propulsion. [ not in citation given] With this form of lift, the grip of an aerial tramway cabin is fixed onto the propulsion rope and cannot be decoupled from it during operations. Because of the proliferation of such systems in the Alpine regions of Europe, the French and German names, téléphérique and Seilbahn, respectively, are often also used in an English language context. Cable car is the usual term in British English, as in British English the word tramway generally refers to a railed street tramway while in American English, cable car may additionally refer to a cable-pulled street tramway with detachable vehicles; e.g., San Francisco's cable cars. As such, careful phrasing is necessary to prevent confusion. It is also sometimes called a ropeway or even incorrectly referred to as a gondola lift. A gondola lift has cabins suspended from a continuously circulating cable whereas aerial trams simply shuttle back and forth on cables. In Japan, the two are considered as the same category of vehicle and called ropeway, while the term cable car means Cable car (railway) and funicular. An aerial railway where the vehicles are suspended from a fixed track (as opposed to a cable) is known as a suspension railway. Two-car tramways use a jig-back system: A large electric motor is located at the bottom of the tramway so that it effectively pulls one cabin down, using that cabin's weight to help pull the other cabin up. 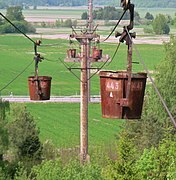 A similar system of cables is used in a funicular railway. The two passenger cabins, which carry from 4 to over 150 people, are situated at opposite ends of the loops of cable. Thus, while one is coming up, the other is going down the mountain, and they pass each other midway on the cable span. Some aerial trams have only one cabin, which lends itself better for systems with small elevation changes along the cable run. Other mining systems were developed in the 1860s by Hodgson, and Andrew Smith Hallidie. Hallidie went on to perfect a line of mining and people tramways after 1867 in California and Nevada. See Hallidie ropeway. Tramways are sometimes used in mountainous regions to carry ore from a mine located high on the mountain to an ore mill located at a lower elevation. Ore tramways were common in the early 20th century at the mines in North and South America. One can still be seen in the San Juan Mountains of the US state of Colorado. Over one thousand mining tramways were built around the world— Spitsbergen, Russia, Alaska, Argentina, New Zealand and Gabon. This experience was replicated with the use of tramways in the First World War particularly on the Isonzo Front in Italy. The German firm of Bleichert built hundreds of freight and military tramways, and even built the first tourist tramway at Bolzano/Bozen, in then Tyrolian Austria in 1913. Other firms entered the mining tramway business- Otto, Leschen, Breco Ropeways Ltd., Ceretti and Tanfani, and Riblet for instance. A major British contributor was Bullivant who became a constituent of British Ropes in 1924. The perfection of the aerial tramway through mining lead to its application in other fields including logging, sugar fields, beet farming, tea plantations, coffee beans and guano mining. A resource on the history of aerial tramways in the mining industry is "Riding the High Wire, Aerial Mine Tramways in the West"
In the beginning of the 20th century the rise of the middle class and the leisure industry allowed for investment in sight seeing machines. Prior to 1893 a combined goods and passenger carrying cableway was installed at Gibraltar. Initially its passengers were military personnel. An 1893 industry publication said of a two-mile system in Hong Kong that it "is the only wire tramway which has been erected exclusively for the carriage of individuals" (albeit workmen) Going to the Isle of Dogs by Lesser Columbus, Bullivant & Co. 1893 page 10. This item can be accessed through an original held by the North of England Institute of Mining and Mechanical Engineers. After the pioneer cable car of 1907 at mount Ulia     ( San Sebastián, Spain) by Torres Quevedo others to the top of high peaks in the Alps of Austria, Germany and Switzerland resulted. They were much cheaper to build than the earlier rack railway. One of the first trams was at Chamonix, while others in Switzerland and Garmisch soon followed. From this, it was a natural transposition to build ski lifts and chairlifts. The first cable car in North America was at Cannon Mountain in Franconia, New Hampshire in 1938. After the Second World War installations proliferated in Europe, America, Japan, Canada and South Africa. Many hundreds of installations have emerged in mountainous and seascape areas. The aerial tram evolves again in latter decades—one tram in Costa Rica was built to move tourists above a rainforest, while one in Portland, Oregon, was built to move commuters. Presently, the mining role of tramways has lessened, though some still work, and moving people remains a starring role for the device. Many aerial tramways were built by Von Roll Ltd. of Switzerland, which has since been acquired by Austrian lift manufacturer Doppelmayr. Other German, Swiss, and Austrian firms played an important role in the cable car business: Bleichert, Heckel, Pohlig, PHB (Pohlig-Heckel-Bleichert), Garaventa and Waagner-Biró. Now there are three groups dominating the world market: Doppelmayr Garaventa Group, Leitner Group, and Poma, the last two being owned by one person. Some aerial tramways have their own propulsion, such as the Lasso Mule or the Josef Mountain Aerial Tramway near Merano, Italy. While typically used for ski resorts, aerial tramways have been ported over for usage in the urban environment in recent times. The Roosevelt Island Tramway in New York City and the Portland Aerial Tram are examples where this technology has been successfully adapted for public transport purposes. One offshoot of the aerial tram was the telpher system. This was an overhead railway, which was electrically powered. The carrier basket had a motor and two contacts on two rails. They were primarily used in English railway and postal stations. The original version was called telpherage. Smaller telpherage systems are sometimes used to transport objects such as tools or mail within a building or factory. First – Adam Wybe construction in Gdańsk (1644). It was the first rope railway with many supports and the biggest built until the end of 19th century. 35 km (22 mi) 1906–1927 Chilecito – Mina La Mejicana, Argentina (34.3 km or 21.3 mi and 0.86 km or 0.53 mi branch). 39 km (24 mi) 1925–1950 Dúrcal – Motril, Spain (33.4 km or 20.8 mi and 5.5 km or 3.4 mi branch). 76 km (47 mi) 1959–1986 Moanda – Mbinda, Gabon – Republic of Congo. 1.0 km (0.62 mi) 1906 – the same century; Thio, New Caledonia. ship loading. 13.2 km (8.2 mi) Norsjö aerial tramway Mensträsk-Bjurfors in Norsjö, Sweden. Passenger tramway, a section of the former 96-km Kristineberg-Boliden industrial ropeway. 4.94 km (3.07 mi) Medeu-Shimbulak tramway near Almaty, Kazakhstan. 4.35 km (2.70 mi) Sandia Peak Tramway, reversible tramway in Albuquerque, New Mexico. Highest lift: 3,374 m (11,070 ft) from 1,074 to 4,448 m (3,524 to 14,593 ft) at Chilecito – Mina La Mejicana, Argentina (drops back to 4,404 m or 14,449 ft at upper terminal). Greater than 5,874 m (19,272 ft) 1935-19?? Aucanquilcha, Chile. 257 m (843 ft) below sea level Masada cableway, Israel. 113.6 m (372.7 ft) Gletscherbahn Kaprun, Austria. The Roosevelt Island Tramway in New York City was the first aerial tramway in North America used by commuters as a mode of mass transit (See Transportation in New York City). Passengers pay with the same farecard used for the New York City Subway. 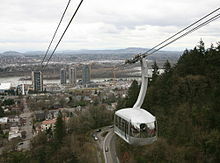 The Portland Aerial Tram in Portland, Oregon was opened in January 2007 and became the second public transportation aerial tramway in North America. In Medellin, Colombia, both the Metro and the recent Metrocable aerial tramway addition can be used while paying a single fare. Palm Springs Aerial Tramway in Palm Springs, California. Despite the introduction of various safety measures (back-up power generators, evacuation plans, etc.) there have been several serious incidents on aerial tramways, some of which were fatal. August 29, 1961: A military plane split the hauling cable of the Vallee Blanche Aerial Tramway on the Aiguille du Midi in the Mont Blanc massif: six people killed. April 15, 1978: In a storm, two carrying ropes of the Squaw Valley Aerial Tramway in California fell from the aerial tramway support tower. One of the ropes partly destroyed the cabin. Four were killed, 32 injured. October 19, 2003: Four were killed and 11 injured when three cars slipped off the cable of the Darjeeling Ropeway. October 9, 2004: Crash of a cabin of the Grünberg aerial tramway in Gmunden, Austria. Many injuries. December 31, 2012: The Alyeska Resort Aerial Tramway was blown sideways while operating in high winds and was impaled on the tower guide, severely damaging the contacting cabin. Only minor injuries were incurred. Cable cars pass mid-stream on the Sandia Peak Tramway in Albuquerque, New Mexico. Plateau Rosa aerial tramway in Cervinia, Italy, moves skiers to 3480 m glacier. The rotating Table Mountain Aerial Cableway is designed to give passengers a 360° view. The lowest cable is used for pulling. The middle cable supports the weight of gondola. ^ "Aerial Technologies, Lesson 5: Aerial Trams « The Gondola Project". Gondolaproject.com. Retrieved 2016-01-02. 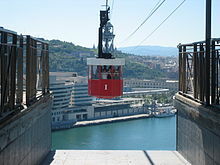 ^ "Basic Lesson 3: Aerial Trams & Funiculars « The Gondola Project". Gondolaproject.com. Retrieved 2016-01-02. ^ Edward S. Neumann. "Cable Propelled Systems in Urban Environments" (PDF). Adr.coalliance.org. Archived from the original (PDF) on 2012-03-14. Retrieved 2015-01-02. ^ "Adam Wijbe-Galeria Wielkich Zapomnianych-Wydział Postaciologii". Rzygacz.webd.pl. Archived from the original on 2015-12-08. Retrieved 2016-01-02. ^ "Cable lift pioneer from Harlingen built Gdansk bastion and dikes » The Windmill news articles". goDutch. Archived from the original on 2010-12-18. Retrieved 2016-01-02. ^ "File:Gibraltar Aerial Railway equipped by Bullivant in Going to the Isle of Dogs Tracts vol 9 p255.jpg – Wikimedia Commons". Commons.wikimedia.org. 2013-12-10. Retrieved 2016-01-02. ^ "Un transbordador pionero 1907". 1997-12-01. ^ "Teleférico – Casiopea" (in Spanish). 2011-06-03. ^ a b Lusted, A., 1985: The Electric Telpherage Railway. Glynde Archivist 2:16–28. ^ "La Teleferica Massaua-Asmara". Trainweb.org. Retrieved 2016-01-02. ^ Widén, E. G. A. (1943). The ropeway Kristineberg-Boliden : A record ropeway construction. Stockholm: Nordströms linbanor. ^ "Linbanan Forsby – Köping". Privat.bahnhof.se. Archived from the original on 2016-01-24. Retrieved 2016-01-02. ^ "Technical data". Maennlichen.ch. GGM/LWM. Retrieved 16 July 2018. ^ "World's longest cable car line opens to Armenia". Physorg.com. Retrieved 2016-01-02. ^ "Ulykken som ingen trodde kunne skje (Norwegian)". nrk.no. 2014-07-09. Retrieved 2019-03-14. ^ "Four Killed In Cable Car Crash In Yerevan". azatutyun.am. Retrieved 2004-04-02. Wikimedia Commons has media related to Aerial tramway. Tatever ropeway – is the aerial ropeway to the natural and historic treasures of Syunik.